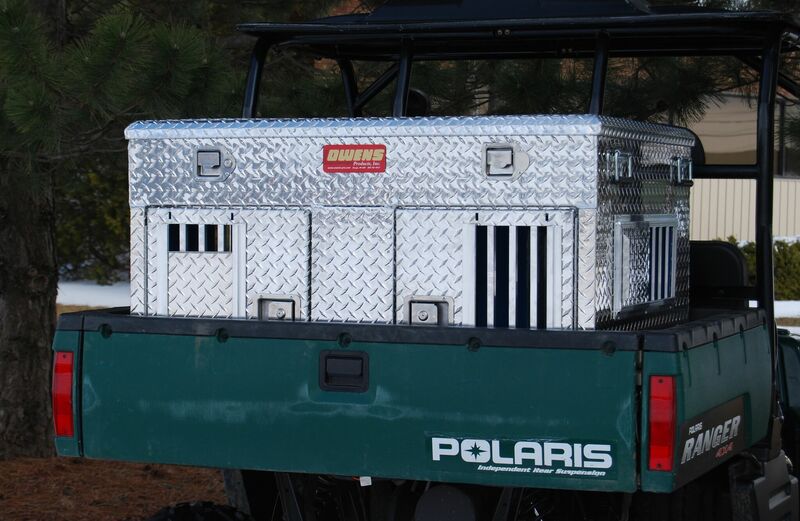 Transport your two best four-legged hunting buddies to and from the field or range in comfort and style with Owens Products Hunter Series Dual-Compartment UTV Dog Box with Top Storage. This dual-compartment dog box features two large, lined dog compartments that boast rugged diamond-tread steel constructions and feature durable, easy-to-clean rubber floors. Plus, what makes this box extra-special, is its comparability with the Polaris Ranger UTV – meaning you can easily head afield with your pups in the back of something other than your pickup. 7” x 10” maximum-flow vents with storm covers keep them comfortably cool during travel in warm-weather conditions. Locking latch doors also include storm covers. Rattle-free spring-loaded carrying handles. Built-in full-length top storage compartment is ideal for stashing dog accessories and hunting gear when not in use and includes a pull strap for quick, easy closure. Made in USA. 35”L x 45”W x 29”H. 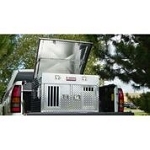 Dog compartment: 20.5”H x 22”W x 34”D. Storage: 6”H x 45”W x 35”D.